ForDogTrainers.comis committed to protecting your privacy online. ForDogTrainers.com will not sell, trade or rent youraddress, e-mail, or accounting informationto any other entity, no matter how much they twist our arms. Also we will not contact you, about issues other than an order placed, without your permission.We use the information you provide to process orders and to create a more personalized shopping experience. Unless you specifically and knowingly provide such information, ForDogTrainers.com will not collect any personal information about you. When you sign up for a newsletter or other emailed communication, we may ask you for your email address so we can send you the updates and information requested. We do not send out unsolicited email. You will only receive communication you have specifically asked for. We may collect certain technical information that helps us to understand our customers' use of the ForDogTrainers.com web site so that we can make improvements. The information collected does not allow us to identify you personally. For example, such information may include the type of Internet Browser you are using and the pages visited. 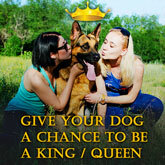 This information enables us to improve your experience at ForDogTrainers.com. By using our web site, you consent to the collection and use of this information by ForDogTrainers.com. If you are under 18 years of age, you must have your parent or guardian's permission to order.